It seems an age ago that we started this Wednesday series on some of London’s ‘battlefields’ (we’ve used quotes given many of the battlefields we’ve covered haven’t featured what we might think of as having hosted battles in the traditional sense). 2016 is fast approaching and to celebrate, we’re looking back at the 10 most popular posts we published in 2015. OK, so not really a battle although it must have felt something like that to those involved (and the ‘battlefield’ turned out to be much of the City itself), the uprising known as Peasant’s Revolt of 1381 saw two great armies march upon London – one from Kent led by Wat Tyler and another from Essex which is said to have been under the command of Jack Straw. The armies had risen in response to a series of events which they saw as unjust and which trace their origins back to the Black Death. Killing about a third of the population when it struck some 30 years earlier, this had resulted in a growing demand for labourers to work the fields raising, as one might expect, hopes of increased wages and greater freedom of movement among the peasant class. But to ensure the social order was maintained, authorities had not only put limits on how much farm workers could be paid but ensured long-standing but increasingly unpopular practices – such as serfs being forced to work some time for free for their landlords – were maintained. On top of this came the imposition and enforcement of a series of poll taxes to fund England’s wars with France. The poll taxes – and the harsh way in which they were enforced – were a step too far and when a tax collector visited the village of Fobbing in Essex in May, 1381, he was shown short shrift and thrown out. The unrest soon spread and by June, the rebels, having rampaged through the countryside were marching on London. By 12th June, the men from Essex were camped at Mile End while Tyler and his army from Kent were at Blackheath. The next day, after being denied a meeting with the king, the rebels headed into the City where sympathetic Londoners opened the gates. Once inside, they targeted the property of those they deemed responsible for their misfortune, opening prisons and destroying any legal records they could find. 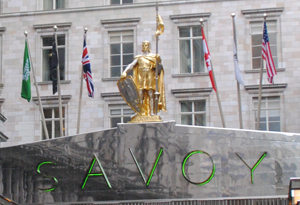 Foremost among the sites attacked and looted was the Palace of Savoy (see our earlier post here), home of the King’s uncle John of Gaunt, Duke of Lancaster, and, as the power behind the throne, the man many deemed as the ultimate source of the ills besetting them (John himself had a lucky escape – he was away from the city when the palace was attacked.). King Richard met with the leaders of the men from Essex on 14th June at their camp at Mile End and, after they pledged their allegiance, agreed to their petitions to abolish serfdom and allow them to sell their labour. But the attacks, meanwhile, were continuing in the City with a group of rebels led by Tyler storming the Tower of London (pictured above) the same day and seizing and beheading the Simon of Sudbury, the Archbishop of Canterbury and Chancellor, along with the Robert Hales, Lord High Treasurer and Prior of St John’s in Clerkenwell – both key figures in the government of the king (you can read more about Simon of Sudbury here). 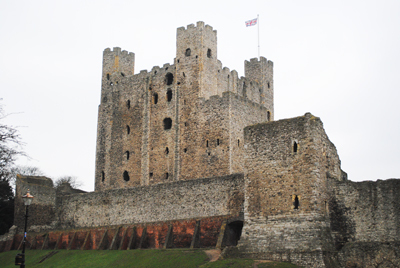 The following day – 15th June – King Richard again met with the rebel leaders – this time with Wat Tyler, leader of the Kentish band, at Smithfield. It was then that things went awry for the rebels. Apparently enraged by Tyler’s insolence (already stories differ as to exactly why he did so), the Lord Mayor of London, Sir William Walworth (see our earlier post here), stabbed Tyler in the neck. King Richard managed to keep the situation under control until armed troops arrived and after the king declared a general pardon, the rebels dispersed. Tyler, meanwhile, was taken to St Bartholomew’s Hospital but on the orders of the Lord Mayor was dragged from his bed and beheaded (his head was displayed atop a pole positioned in a field). He was among dozens of the rebels who were subsequently executed for their role in the uprising (leaders Jack Straw and another, John Ball, were among them). Hidden away to the north-west of the City of a quiet cul-de-sac, the oldest still-in-use Roman Catholic church in London (indeed, in England) is St Etheldreda’s Church in Holborn. 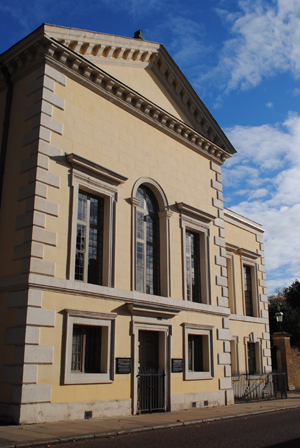 Located in Ely Place, this atmospheric church – named for Etheldreda, seventh century female abbess of Ely – opened as a Roman Catholic Church in 1878, although the building in which it is lodged is much older, indeed a rare survivor from the 13th century. It was built in 1290 by John De Kirkeby, the Bishop of Ely and Treasurer of England during the reign of King Edward I, as a chapel to a residence he constructed on the site. It and the adjoining palace remained in use by subsequent bishops and other nobles (including John of Gaunt who lived here after his own residence, Savoy Palace , was burnt down during the Peasant’s Revolt) up to and after the Reformation – the first reformer Bishop to use it was Thomas Goodrich, who built the nearby Mitre Tavern. (Worth noting is that the church also has some strong links to Shakespeare – there’s a great article on the church’s website exploring these). 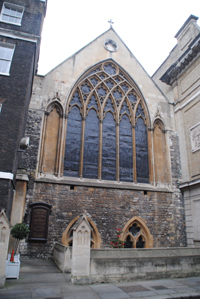 In 1620, the Spanish Ambassador, the Count of Gondomar, moved into Ely Place and the chapel was used once again for Catholic masses (the residence was considered part of Spanish territory) – this was a relatively short-lived development for, thanks to deteriorating relations between England and Spain following a failed match between Prince Charles (later King Charles I) and the Infanta of Spain, the next ambassador was refused permission to live there. 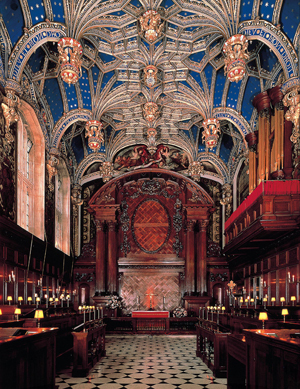 Having escaped destruction in the Great Fire of London, the chapel was requisitioned by Parliament as a prison and hospital during the Civil War and subsequently fell into disuse before in 1772, the property – including the chapel – was sold to the Crown who in turn sold it to a surveyor and builder, Charles Cole. Cole demolished the palace buildings with the exception of the chapel and had the current Ely Place built with neat rows of Georgian homes, modernising the chapel for the use of residents as an Anglican place of worship. The church attracted few worshippers, however, and in 1820 was taken over by the National Society for the Education of the Poor. In 1873, the chapel was again to be sold and following a somewhat controversial auction was bought by the Catholic Institute of Charity (aka the Rosminians) and restored under the eye of Father William Lockhart (the Catholic Emancipation Act had been passed in 1829, allowing Catholics to have churches and say mass). Interestingly, it was during this work that 18 bodies were discovered buried in the crypt – they had died in the ‘Fatal Vespers’ of 1623 when, during a secret meeting of Catholics at the French ambassador’s house in Blackfriars, the floor collapsed and more than 100 were killed. Not able to be buried publicly due to anti-Catholic feeling, they were buried in secret with some of them buried here. A mass commemorated the completion of the restoration work on 23rd June, 1878, and the church has been in use as a Roman Catholic Church ever since (although years of repairs were needed following significant bomb damage in World War II). Further restoration work was carried out in the 1990s when Flemish tiles from the original cloister were discovered. These days the church – which features a relic of St Etheldreda contained in a bejewelled cask sitting by the altar – is a quiet oasis in the midst of the bustling city – a great place to take some time out in the midst of a busy day. Also of note is the east window – the work of Joseph Edward Nuttgens, it was completed in 1952 and, like all the other windows, replaced a Victorian window destroyed in the Blitz (look for the image of St Etheldreda) – and the west window – the work of Charles Blakeman, it is apparently the largest stained glass window in London and depicts a series of English Catholic martyrs. WHERE: St Etheldreda’s Church, Ely Place (nearest Tube stations are Chancery Lane and Farringdon); WHEN: 8am to 5pm Monday to Saturday; 8am-12.30pm Sunday; COST: Free; WEBSITE: www.stetheldreda.com. Now the largest wholesale meat market in the UK and one of the biggest in Europe, the connections between the site of Smithfield Market, officially known as the London Central Markets, and livestock go back to at least 800 years. Since the 12th century animals were routinely traded here thanks to the site’s position on what was then the northern edge of the city. Smithfield was also known for being an area for jousting and tournaments and was the location of the (in)famous St Barthlomew Fair (this closed in 1855) as well as an execution ground – among those executed here were Wat Tyler, leader of the Peasant’s Revolt, and ‘Braveheart’, Sir William Wallace (1305). Skip ahead several hundred years and, by the the mid-1800s, traffic congestion led to the livestock trade being relocated to a new site north of Islington. 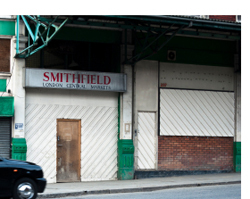 Plans were soon launched to locate a cut meat market on the Smithfield site. Following the passing of an Act of Parliament, work on the new market began in 1866 with Sir Horace Jones (he of Tower Bridge fame), the City Architect, overseeing the design. Constructed of ornamental cast iron, stone, Welsh slate and glass, the initial market buildings were completed in 1868 with the result being two vast buildings, separated by a grand central avenue, but linked under a single roof. The new market was opened amid much pomp by the Lord Mayor of London on 24th November, 1868. Four further buildings were soon added – only one, the Poultry Market, which opened in 1875, is still in use – and in the 1870s the market began to see the arrival of frozen meat imported from as far afield as Australia and South America. Closed briefly during World War II – when the site was used for storage and an army butcher’s school – it reopened afterwards. The main poultry building was destroyed in a fire in 1958 and a replacement featuring a domed roof – the largest clear spanning dome roof in Europe at the time – was completed by 1963. More recently, the market underwent a major upgrade in the 1990s. Queen Elizabeth II opened the refurbished East Market Building in June, 1997. WHERE: London Central Markets, Charterhouse Street and West Smithfield (nearest Tube Stations are Barbican, St Paul’s and Moorgate); WHEN: From 3am Monday to Friday (visitors are told to arrive by 7am to see the market in full swing) (There are walking tours available – see www.cityoflondontouristguides.com for details); COST: Free entry; WEBSITE: www.smithfieldmarket.com. Nestled on Tower Hill, somewhat overshadowed by the monumental memorial to the merchant naval casualities of World War I and II nearby, lay a series of plaques commemorating more than 125 people who were executed there. 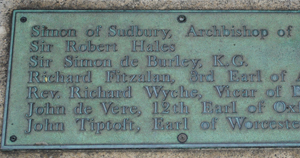 The plaques, which stand on the site of the former scaffold, list the names of some of the most prominent who died there including Simon of Sudbury, Archbishop of Canterbury, who was beheaded by an angry mob during the Peasant’s Revolt in 1381, John Fisher, the Bishop of Rochester, and former chancellor Sir Thomas More – both of whom were executed in 1535 on the orders of King Henry VIII, and Thomas Cromwell, another chancellor who fell foul of King Henry VIII and was executed in 1540. Later executions include William Laud, another Archbishop of Canterbury who was executed in 1645, James, Duke of Monmouth, the illegitimate son of King Charles II who was executed in 1685, and Simon Fraser, Lord Lovat, who became the last man to be executed there in 1747 (and the last man in England to be beheaded) after his capture following the Battle of Culloden in Scotland. An inscription at the site reads that the memorial was created to “commemorate the tragic history and in many cases the martyrdom of those who for the sake of their faith, country or ideals staked their lives and lost”. 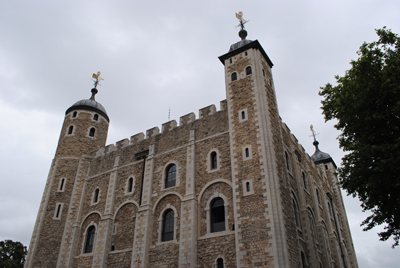 It’s worth noting that contrary to popular belief only 10 people were ever executed on Tower Green inside the Tower of London including two of King Henry VIII’s queens – Anne Boelyn (1536) and Catherine Howard (1542) – as well as the tragically young Lady Jane Grey, queen for only nine days before she was beheaded in 1554, and three Black Watch soldiers who were shot in 1743 after being charged with mutiny. In the first of a new regular series looking at “lost” London, Exploring London takes a look at London Bridge. It’s a commonly confused fact that many first-time visitors to London think Tower Bridge and London Bridge are the same. As Londoners know, London Bridge (pictured right with St Paul’s and the city in the background) lies west of Tower Bridge. It’s not a particularly inspiring bridge having been built in the early Seventies. But there’s been a bridge spanning the Thames here for almost 2,000 years. So what happened to Old London Bridge? 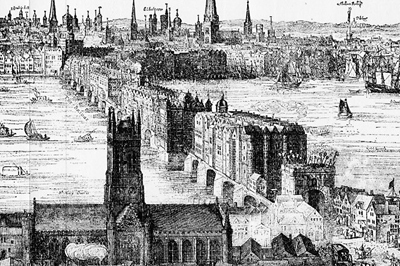 The first bridge built across the River Thames on or close to the current site of London Bridge is thought to have been a wooden pontoon bridge constructed by the Romans around 50 AD. It was quickly followed by a more permanent bridge (rebuilt after it was destroyed by Boudicca and her marauding army in 60 AD). Following the end of the Roman era, the bridge fell into disrepair although it’s known that there was a wooden Saxon bridge on the site by around the year 1,000. A succession of Norman bridges followed the Conquest and in 1176, during the reign of Henry II, construction of a new stone bridge began under the supervision of the priest Peter de Colechurch to service to growing numbers of pilgrims travelling from London to Thomas a Becket’s shrine in Canterbury. The new bridge, which had a chapel dedicated to St Thomas at the centre, wasn’t finished until 1209. 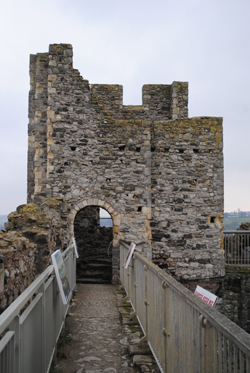 The bridge had 19 arches sitting on piers surrounding by protective wooden ‘starlings’ and a drawbridge and defensive gatehouse. The design of the bridge meant the water shot rapidly through the arches, leading boatmen to describe the practice of taking a vessel between the starlings as “shooting the bridge”. King John, in whose reign the bridge was completed, licensed the building of houses on the bridge and it soon became a place of business with some 200 shops built upon its length, many of them projecting over the sides and reducing the space for traffic to just four metres. Many of the buildings actually connected at the top, creating a tunnel-like effect. One of the more remarkable buildings on the bridge was Nonsuch House, built in 1577. A prefabricated building, it had been assembled in the Netherlands before being taken apart, shipped to London, and then reassembled. No nails were used in its construction, just timber pegs. The practice of putting the heads of traitors on pikes above the southern gatehouse (see picture right, dating from 1660) started in 1305 with Scottish rebel William Wallace’s head and continued until it was stopped after 1678 when goldsmith William Stayley’s head was the last to be displayed there. 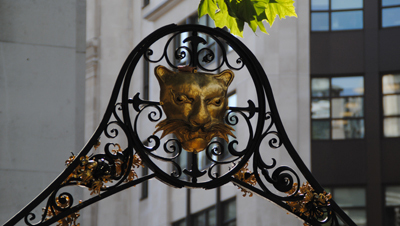 Famous heads to adorn the gateway over the years included Peasant’s Revolt leader Wat Tyler in 1381, rebel Jack Cade in 1450, the former chancellor Sir Thomas More and Bishop John Fisher in 1535, Thomas Cromwell in 1540 and Guy Fawkes in 1606. 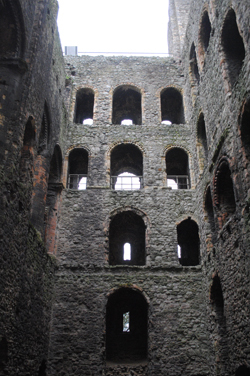 Some of the bridge’s arches collapsed over the years and had to be restored and there were several fires which destroyed houses upon it, including those which occurred during the Peasants’ Revolt in 1381 and Jack Cade’s rebellion in 1450. Congestion reached such a state by the 18th century that in 1756 Parliament passed an act which allowed for the demolition of all the shops and houses upon it (it had remained the only bridge spanning the Thames east of Kingston until Westminster Bridge was completed in 1750). This was carried out in 1758-62 along with the removal of two central arches which were replaced with a single wider span. With traffic only increasing – by 1896, 8,000 people and 900 vehicles were reportedly crossing the bridge every hour – it was clear a new bridge was needed and work on a new stone bridge with five arches – following a design competition won by John Rennie – began in 1824. The old bridge, located about 30 metres east of the new one, remained in use until the new one was opened in 1831. Widening work carried out the early 20th century, however, was too much for the bridge’s foundations and it began to sink. 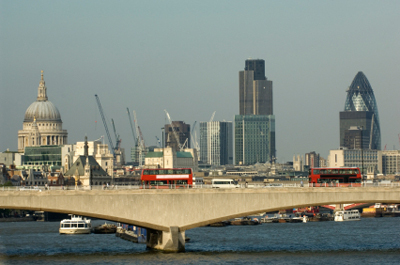 What followed was one of the strangest episodes in the bridge’s history when in 1967 the Common Council of the City of London decided to sell the bridge. It was sold the following year to Missourian entrepreneur Robert P. McCulloch of McCulloch Oil for $US2.5 million. Carefully taken apart piece by piece, the bridge was then transported to the desert resort of Lake Havasu City in Arizona in the US and rededicated in 1971. The current London bridge, designed by Mott, Hay and Anderson, was built from 1967 to 1972 and opened by Queen Elizabeth II in 1973. It stands on the same site as the previous bridge. As for the song, “London Bridge is falling down”? There’s several stories to explain its origins – one being that it came about as the result of an attack by a joint force of Saxons and Vikings on Danish held London in 1014 during which they pulled the bridge down, and another being that it became popular after Henry III’s wife, Queen Eleanor, was granted the tolls from the bridge by her husband but instead of spending them on maintenance, used it for her own personal use. Hence, “London Bridge is falling down, my fair lady”. PICTURES: Top: © Steven Allan (istockphoto.com); Bottom – London Bridge (1616) by Claes Van Visscher. SOURCE: Wikipedia.